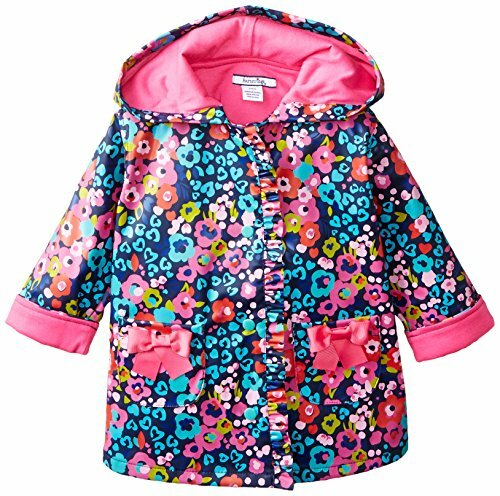 Cute raincoats for little girls! 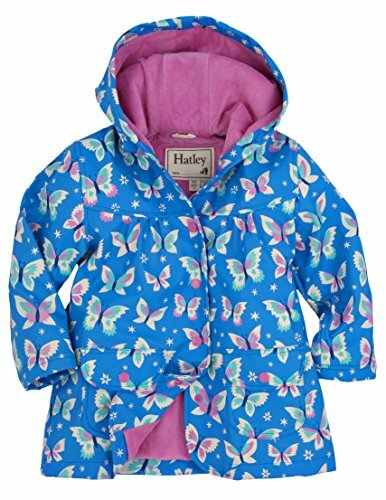 Find a raincoat that your little girl will love to wear. Updated for 2015. Rainy weather is upon us! If you have a little girl who needs a raincoat to keep her cozy and dry while walking in the rain, you'll love these raincoats made just for her! 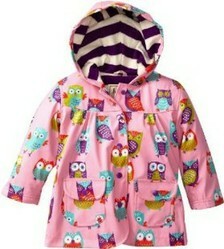 Whether she likes horses or butterflies or owls or flowers, there's a raincoat here she'll love! There's even a video version of Raffi's "Ducks Like Rain" that you can listen to while you shop! This lovely floral coat will remind you of why we have spring rain in the first place. Pretty flowers in multicolour. Nice hood to keep her protected. This raincoat will keep your little girl dry. 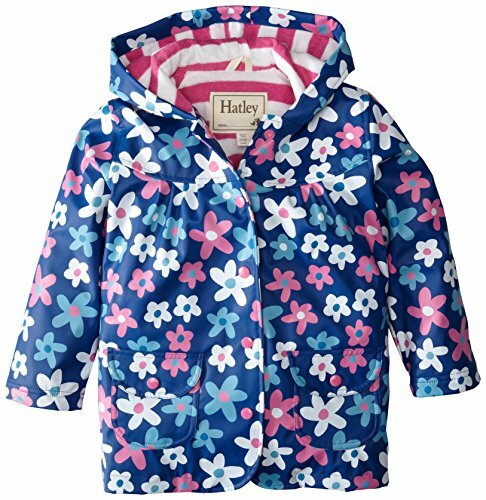 All of the Hatley Girls' Raincoats are made from PVC-free plastic for a raincoat that gives great protection from the rain while keeping your little one safe from toxic PVC. They are also lined with french terry to keep her comfy and warm when going out in the rain. The shell is 100 % polyurethane, while the lining is made from 78% cotton and 22 % polyester. One thing that is great about these raincoats is that you can throw them into the washing machine and then hang them to dry, so even if your little girl loves the mud, you don't have to worry about having her ruin her coat. 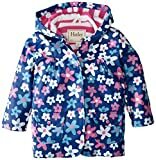 Each of these Hatley raincoats has stylish gathers in the front and pockets for holding treasures or that all important tissue for wiping her nose. Most of these designs come with matching rubber boots and some with umbrellas, as well. 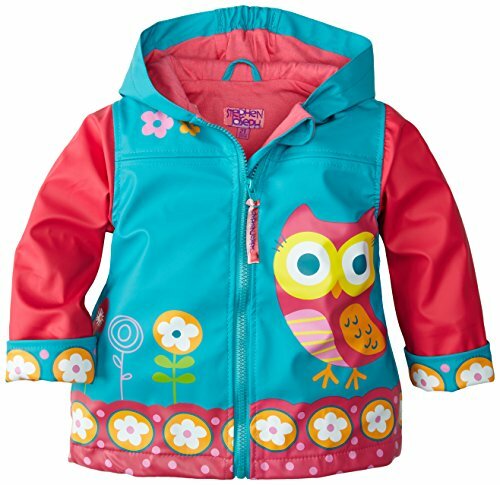 Your little girl can be truly decked out in style with a full rain gear set! Pink Platinum's Girls' Raincoats are made from 100% polyester and have large colorful buttons down the front. They are coated for wearing in the rain. They are also fully machine washable. These raincoats are a less expensive option if price is your major concern. Pink Platinum makes polka dotted raincoats as well as other designs. These rain coats are so much fun to wear! I love their bright colors that can spruce up any rainy day and make us all a little more cheerful. And when paired with a pair of rubber boots, they will help any little girl to enjoy her foray into the raindrops. Springtime is a season of rain in my part of the world. Autumn usually includes a good bit of rain as well. Any of these raincoats would make a great gift for a special girl. Her walks to school or in the neighborhood will be much more pleasant when she is protected from the wet weather. Did You Find a Raincoat for a Little Girl You Know? Glad you found it helpful, Holly. I love playing in the rain, too! While searching for raincoats I came across your great selection from last year! My little girls love playing in the rain and I love to see them in something bright and colourful. Thanks, Wendy. They are really cute. So cute. I love the raincoats you selected. Samsara, I agree. The raincoats we used to wear were just not pretty! I'll bet a little girl will be much more eager to wear a raincoat like one of these. Katie, I think encouraging outdoor play is a good thing, even in the rain. 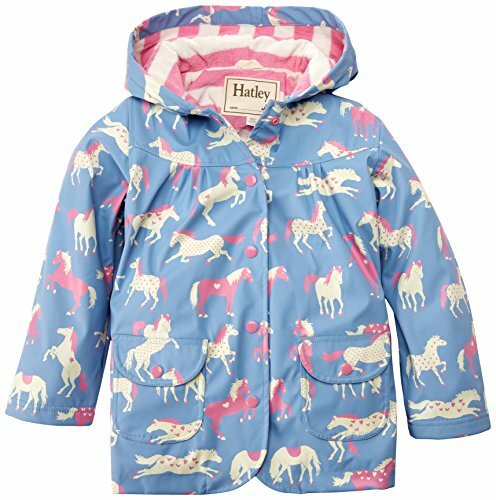 Wendy, I like those raincoat designs, too, but I must admit, the horses are my favorite. I love watching my two daughters play in the rain, the fun rain coats and boots always make for a much better time. Great rain coats. Lighthouses call something forth from deep within us. Lighthouses symbolize safety and hope in the fog of life.